TopVue Air for Astigmatism are toric, silicone-hydrogel contact lenses. Their unique stabilisation technology helps keep the lens in the correct position on the eyeball to ensure sharp vision and maximum comfort. This package contains 3 lenses. TopVue Air for Astigmatism are toric contact lenses made from an innovative, silicone-hydrogel material. 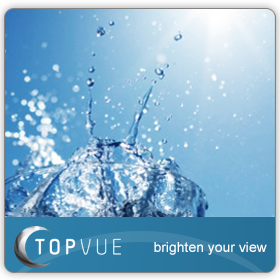 TopVue Air for Astigmatism are characterised by high oxygen permeability and a high water content. The design of TopVue Air for Astigmatism contact lenses uses progressive technology that provides stable positioning of contact lenses on the eye, in every situation, throughout the day. We also offer a larger package of six TopVue Air for Astigmatism lenses, as well as TopVue Premium for Astigmatism bi-weekly toric contact lenses. How do TopVue Air for Astigmatism Contact Lenses Work? TopVue Air for Astigmatism contact lenses feature a stabilisation technology called SHT PrismBallast, which helps to achieve the perfect positioning of the lens on the eye. The prism ballast design makes the lower part of the lens thicker, using gravity to facilitate a perfect fit on the eye. The SHT PrismBallast technology eliminates the rotation and movement of the lenses, because the mass of the ballast is distributed in a unique way. Because of their special shape and distribution of mass, TopVue Air for Astigmatism contact lenses provide smooth movement for the eyelid over the whole area of the eyeball. The natural process of blinking also helps the lens to stabilise. The lenses work with the unique motion of your upper and lower eyelids to help keep the lenses in place. TopVue Air for Astigmatism contact lenses are packaged in a blister pack filled with a solution that is fortified by added sodium hyaluronate. Sodium hyaluronate has absolute compatibility with the physiological environment of the eye. Thanks to the sodium hyaluronate solution, TopVue Air for Astigmatism lenses are comfortable from the first use. The innovative technology of silicone-hydrogel materials allows TopVue Air for Astigmatism to transport atmospheric oxygen to the cornea through microscopic channels at a very high rate. This ability to transfer oxygen (transmissibility) is 100 Dk/t in TopVue Air for Astigmatism. Another important parameter of all contact lenses is their water content. These TopVue lenses contain 45% water. Thanks to their high water content, they remain sufficiently hydrated throughout the day. This high water content also reduces deposits on the lens surface and minimises the risk of infection. Really comfortable, you really notice the amount of oxygen that passes through the lens. Happy with the purchase as the price is affordable. Hello, I normally wear Acuvue Oasys for Astigmatism. However, I am finding that my eyes are becoming dry after around 5 hours and becoming red in the corners, despite the use of eye drops and trials of different solutions. I see that the water content in these lenses is higher than the current brand I am using and was therefore wondering whether these would be more comfortable/hydrating? Great value for astigmatism. I was considering going back to glasses full time, as I just couldn't budget for lenses, but these have saved me. Many thanks. Easy to use website and great communication throughout the order process. Very impressed with the service. Lenses arrived quickly and with zero hassle. Thank you for the smooth delivery. Cheap and effective. Very pleased with this brand. Reordering is a breeze too. Fast service and excellent communication. The lenses are comfortable and durable. Very satisfied. Comfortable lenses for astigmatism that don't break the bank. Highly recommended. Good toric lenses. No problems with comfort or clarity. Overall very pleased. Very good lenses for astigmatism. Great comfort, and non-drying. Quick delivery and great service all around. comfortable to wear, and clear vision. impressed with these lenses. I now prefer this product to any others I have tried. They feel natural and never slip out of place. I have struggled with other lenses for my astigmatism, but I can wear these comfortably for 10-12 hours with no problems. Excellent lenses. Great lenses - every bit as good as the acuvue, and better priced, as well. Very pleased with these lenses, the cost, and overall service I received. Lenses feel fresh and clean all day, even when I wear them a bit longer than usual. No unnecessary movement of the lenses on my eyes either, which is a plus. Great lenses and affordable price. Can't ask for anything more, thanks! First contact for astigmatism that I've been able to wear for longer periods of time. Very comfortable to wear. Pleasantly surprised with these lenses. Good value for the low price. I've always had problems with floating lenses with my astigmatism, but these seem to solve the problem. Very light and pleasant to wear. On the boxes of my current contact lenses the BC is 8.50 and the diameter is 14.5. Your website is not giving me the option to change this. Please clarify. Hello, Some of the following lenses with special parameters may be out of stock. When you enter the parameters of lenses you would like to purchase, it will automatically show you whether we have them in stock and what is the dispatch time. what if your right eye cylinder is 1.50 but theres no option for it? as i need the exact perscription. Hi, generally it is possible to select the closest match in terms of cylinder size but we would recommend discussing this with your opticion.